Are your customer experience initiatives moving the needle? Are they differentiating you from the competition or meeting customers’ expectations? If the answer is anything other than a resounding “Yes!”, don’t worry – you’re not alone. A recent report by Forrester found that in 2018, the majority of US brands failed to make any significant CX improvements – for the third year running. The analyst firm also predicts that, in the coming months, some brands will call off their CX initiatives altogether. It’s a troubling prediction, because good customer experiences have become a key driver of loyalty and an important source of competitive advantage. If you’re reading this, you’re probably of the camp that’s not ready to give up on achieving CX success. So how do you get your CX projects moving forward and driving business results? The key is getting back to basics, with tangible improvements. We’ll dive into each of them in more detail below. Over the last few years, CX has been a key talking point – and major buzzword – in marketing circles across sectors. 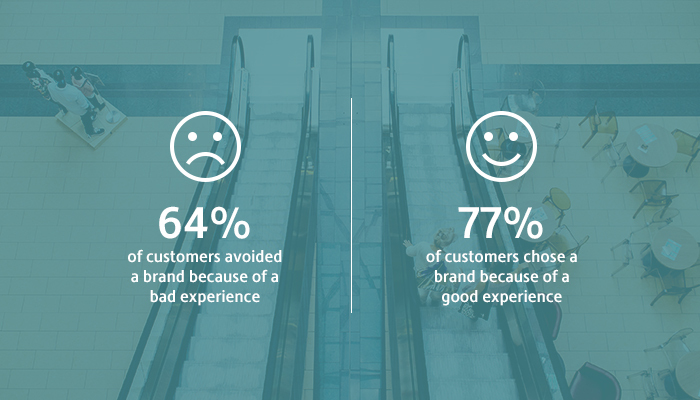 As a result, many businesses have jumped on board without fully understanding why CX matters. But it’s important to have a clear understanding of the purpose of CX, to keep your strategy on track. Because the goal isn’t higher customer satisfaction scores; it’s emotional loyalty and the commercial benefits that come with it. Better customer experiences are about connecting with customers on an emotional level. As consumers, we all use emotion when making buying decisions – whether we’re aware of it or not. The goal of good CX is to foster positive emotions, so that when rational factors like convenience or price are the same, customers still choose your brand over the competition. Ultimately, then, CX is about growing sustainable customer loyalty, based on emotional connections, rather than price. It’s important that the business-wide CX strategy is centred around the end-goal of increasing loyalty – in the form of retention, lifetime value, and advocacy. That will make it much easier to prioritize CX projects, decide next steps and measure results. The dreaded data silo. Disconnected customer data / insight is one of the biggest barriers to CX improvement – whether the source of the problem is down to software or internal policy. Good CX is highly dependent on data. To keep interactions personalized and valuable, you need to understand the customer’s relationship with your business over time. When each interaction is driven by a different dataset or decision-making process, the end experience suffers. Your number one CX priority in 2019 should be breaking down these barriers and getting your data under control. How? Start by identifying the source of the silo. It may come down to the culture of your organisation – for example, leaders who are overly cautious about sharing data between teams. In that case, you’ll need to make a case to your senior management team for the importance of making relevant data accessible to the right people. More often than not, though, the problem lies in technical capability. Once teams are on-board with the idea of improving CX, the desire to share data isn’t the problem – it’s simply that different the processes, databases and tech platforms used by each team make it difficult to join up data. The solution is to find a central hub that can take in data from multiple different sources, unify it, and make all that data available to any connected platform that needs it. 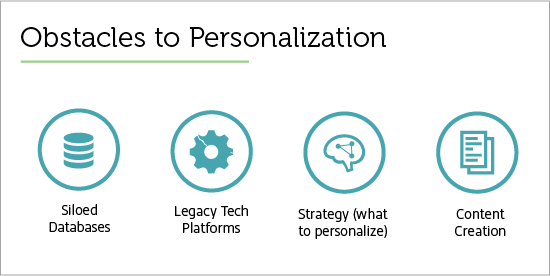 Personalization has been a talking point for a long time, and it can seem a bit over-hyped. But the truth is, it’s key to creating emotionally-engaging experiences. Making a customer feel recognized and valued is an essential part of building loyalty, and this feeling doesn’t really happen with “one-size-fits-all” experiences. When you present the customer with content tailored to their interests or needs – while showing them less irrelevant information – positive emotional connections start to form. And when you move beyond the basics of personalization (like product recommendations based on previous purchases) to something more advanced, that’s when your brand can really start to stand out. So personalization is important – but it’s also something a lot of companies are struggling to master. Siloed databases make it hard to create richer, more relevant experiences. And even when your data is joined up, there’s still the challenge of knowing what and how to personalize – both in terms of content and execution. So what does it look like to prioritize personalization in 2019? Start by doing an audit of where your brand currently stands. How are you using data right now to tailor the experience? What are your competitors doing? Make sure you’re hitting the basics first, before trying to do something more advanced. When working out where you might use personalized content, remember that your primary goal is to create value for the customer. Recognizing someone is only half the battle – being helpful is equally important, and often the thing that separates “creepy” and “cool”. Talk to customers to identify pain points in the customer journey, and think about ways that personalization may be able to help. One final point on CX success: Make sure you’re keeping customer value front-of-mind at every stage, from strategy to implementation. According to Gartner, brands are struggling to create value through CX, with just 22% of CX professionals saying that their efforts exceeded customer expectations. Whether you’re communicating the purpose of CX to the wider business, working with IT to manage data more effectively or brainstorming opportunities for personalization, you should always be thinking about how these efforts will benefit your customers. It’s easy to get caught up by the latest flashy tech or impressive innovation from a CX leader, and want to jump on board. But if a tactic or approach doesn’t create value for your unique customers, it won’t be effective at driving loyalty. To see tangible CX improvements in the coming months, most businesses will need to get back to the basics. Make data management and personalization top priorities – and remember that the end-goal is to grow loyal, profitable customers.